We love the Azkals not just because they're gorgeous, but because they're able to raise spirits across the nation. They train hard, they overcome obstacles, they've traveled a rough path to get where they are now--and they don't give up. They're icons of perseverance. Even having lost their latest match against Kuwait, we remain loyal fans, and they continue to train. It's no surprise then that the new pain reliever Cortal SQR--with the slogan "We believe kaya mo 'yan!" --has chosen the Azkals to be their brand ambassdors. Azkals use Cortal SQR as their official pain reliever, with its advanced formula that combines Ibuprofen and Paracetamol to provide relief from musculoskeletal pain, joint pain, migranes, sprain, strain, backache, and stiff neck, in less than 15 minutes! For ladies, it can also ease dysmenorrhea! Phil Younghusband: "I have been heartbroken, back when I was younger. When you're heartbroken, it's important to keep your mind on things and keep busy. Make sure that you have good people around you--family, friends. That's when you find out who your real friends are--the ones who support you. Stick with your friends as much as possible. They tend to give you compliments, and that sort of thing helps to get by." 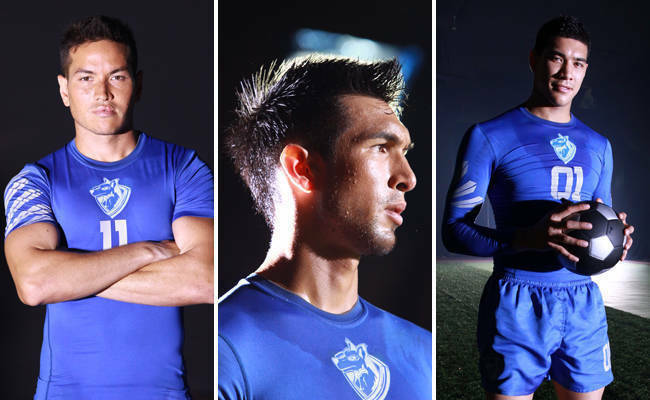 James Younghusband: "Yeah, I was heartbroken once. The main thing I did is just play football, to forget about the bad experience and move forward. Do the things you love. And, if you're in a relationship [to avoid a breakup or] when you're going through a rough patch, just talk it out. Be honest with each other. The truth will set you free. That's my favorite slogan." Neil Etheridge: "I don't know if I've ever really had my heart broken. It's hard to really tell when you're in love, I guess. But of course, I was upset when my relationship ended. My advice is, you've got to know that everything happens for a reason. Sometimes, it's just not meant to happen or be that way. Don't take it too hard. I'm sure there's someone else out there for you. And to be honest, you can learn from your mistakes with your old partner and be better with your new one. You can change yourself." Misagh Bahadoran: "Yes, I was heartbroken two or three years ago. What I did to get over it was rest at home and play football so I wouldn't think of her. I was also a bit of a bad boy—partying and drinking, you know. My advice is to do something that you love and just have fun. That's it." Anton del Rosario: "Have I ever been heartbroken? Yes. Well, my ex-girlfriend and I didn't have a bad breakup, but she ended up moving away. You know, in time, I think your heart will always heal. Just allow yourself a little bit of time for you to move on." Nate Burkey: "I think everyone can relate to a broken heart. It can apply to playing [football] as well. You're playing a big game and then you lose or you don't perform the way you want to, it can be heartbreaking. My brother told me the best way to heal the heart is time. No matter what you do, if your heart is really broken, it needs time." Aly Borromeo: "Well, I'm not really an expert [on heartbreak]. I've been with my girlfriend for a long time; we've never really been separated. We've been through a lot of ups and downs, but we make it through. So, [to avoid a breakup or] for couples going through a rough patch--communication is key. Communication is really one of the most important things in any relationship." Paul Mulders: "I have been heartbroken and it was really hard. I was so desperate. I really loved her a lot. My advice is to remember that there are plenty of other guys out there. There are enough fish in the sea. But, you also have to wait to be lucky enough to get your match. It's hard to find your match. Be patient." Rob Gier: "To be honest, when it comes to heartbreak, I'm probably not the best guy to ask because I'm married to my childhood sweetheart. We met when we were 16, we've been married four years. (Ed's note: They're expecting a baby!) But to avoid a breakup, in any relationship, I think it's important that there's a certain amount of give and take. Trust, as well, is the most essential part of a relationship. If there's no trust, I don't think it's worth the tears."